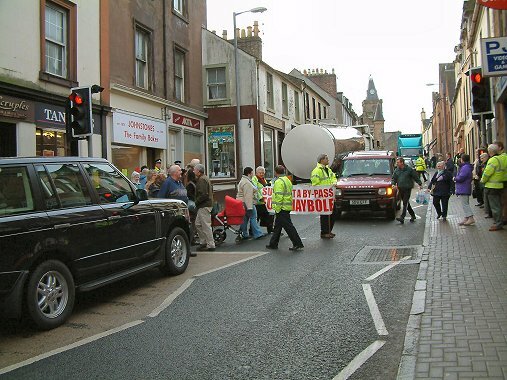 Maybole’s protest to achieve a bypass for the town took to the street on Saturday morning. Outside the Town Hall, Peter Mason, who chairs the Bypass committee, thanked everyone for going along including the four candidates in the by-election. He added that he had also received an e-mail from Cathy Jamieson MSP to say that she was sorry she could not be there because of ministerial duties. He went on to explain the reason for starting the bypass action, “We are still awaiting the final draft of the STAG 1 report which should have been complete in the autumn. Even after the report comes out, it is still up to the Transport Minister to say whether we are getting a by pass or not, even if the stag report comes out in favour of a by pass. Work will not start until 2010 at the earliest. “We have written, we have asked , we have pleaded. Mr Mason also said that the action they were taking would be the first of many and varied forms of protest that the Bypass Committee was planning. He outlined what was happening on Saturday saying that the committee were going to re-launch their banner , then walk down the High Street to the pedestrian crossing, and cross over the crossing a few times. He stressed that the protest would be carried out peacefully and legally using the lights on the crossing as they should be used. He then invited anybody who wished to do so to take part in the protest. The action certainly seemed to be effective as even using the crossing legally there was soon a build up of traffic. Afterwards Mr Mason said he was “absolutely delighted” with how the action had gone and commented, “On behalf of the committee I would like to thank everybody who was there - the infants in buggies, the young people, and the not so young people, who all contributed to make this day a success. I would like to offer a special word of thanks to the police for their attendance. 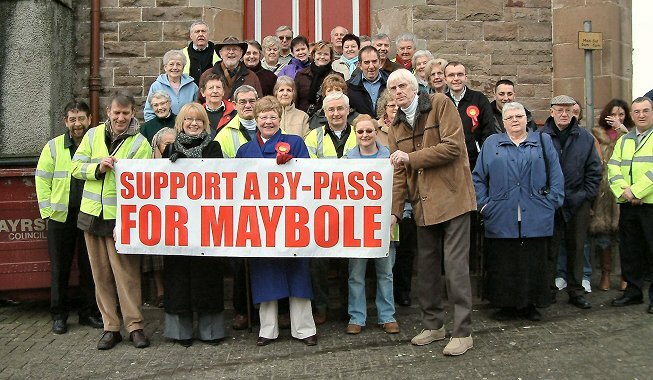 The campaign for a Maybole by-pass is moving on this week with local groups being contacted for support and a letter being made available for local people to copy and send to the Transport Minister. Following on from the recent protest in the High Street, the Bypass Committee met last week to review the event. In general, the committee members were pleased with how the action had gone, especially the fact that no one had been hurt on what is regarded as a very dangerous road. Committee chairman Peter Mason said, “For a first try, we felt it was successful and there has been some good feedback. We have got people talking about a bypass again and there was a good response from drivers, including lorry drivers. All local groups will be invited to attend a joint meeting in the Welltrees Inn on March 14 at 7.30pm to plan further action. A letter to the Transport Minister will be placed in Maybole Resource Centre this Friday and everyone is asked to sign a copy and send it of to the Scottish Executive. 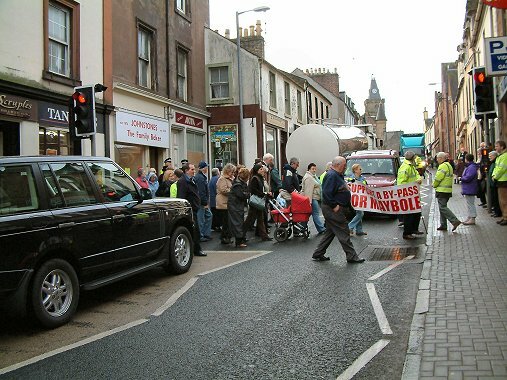 MAYBOLE the historic capital of Carrick has been waiting for over 50 years for a byPass. The rumbling of the traffic through our town is having an adverse effect on our historical buildings. Parents with young children are terrified to walk down the street with their prams in fear of traffic mounting the narrow pavements. A tragic accident is waiting to happen!!!! We are aware that the STAG 1 report has now been completed. The town waits in anticipation for the results and to learn of the next step which will be taken towards agreeing to a bypass. How much longer do we as citizens, both young and old, have to wait for our main street to be safe to walk down? We urge you to look favourably on a bypass for Maybole. John Campbell from Maybole runs his own Executive Travel service and drives thousands of miles a year all over Scotland and the rest of the UK. 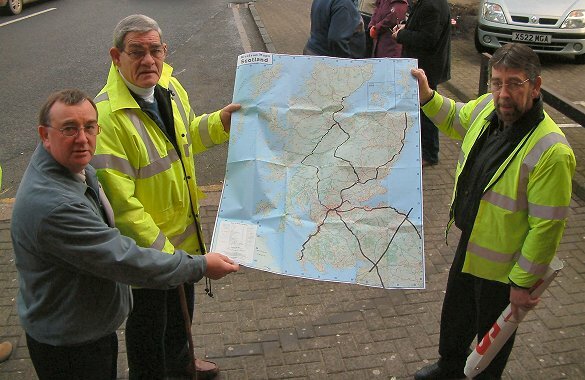 On Saturday he claimed that the A77 in South Ayrshire is the worst he travels. “There are only two bank hole in the wall units and they are both in Maybole, and one of them you can almost reach from your car,” he added. On the topic of roundabouts he claimed there are only about four on the main roads north at Perth, Dunblane and Kirkintilloch but in South Ayrshire there are a total of eight – five around Ayr and three at Girvan. He said that the roads in this area are affecting the tourism attracted to South Ayrshire claiming that holiday operators especially in the golf industry were not directing people here because of travel conditions.